On solid ground, on water or in the air. In terms of flexible solutions. Because logistics is our passion. We count on Swarm Intelligence. With Quehenberger Logistics, you rely on a logistics partner with “handshake quality”. As a full-service logistics provider, we offer you a complete package of well-conceived transport and logistics concepts – precisely tailored to your individual requirements. Safe and timely arrival at the point of destination is enabled by our Full and Less Than Full Truck Loads. A fleet of 400 vehicles along with certified transport partners in Central and Eastern Europe, state-of-the-art technology, innovative software solutions and a single point of contact make that possible. Smooth, long-term partnerships with added value. For our customers, we offer a comprehensive individual package, international and uniform quality standards as well as a professional and comprehensive customer support from planning to implementation. Quickly and safely to the destination via Air Freight. From fast door-to-door solutions to individual transport concepts and customs services, we offer you a customised and reliable full-service package with short lead times and optimised freight costs. Efficiently to the other end of the world via Ocean Freight. A comprehensive service, optimised freight costs and lead times as well as reliable and smooth processing await you with the individual Ocean Freight solutions by Quehenberger Logistics. Connected throughout Europe to your benefit. 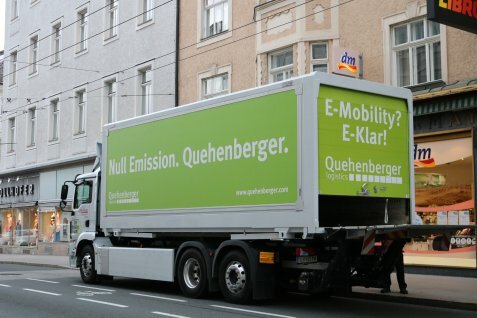 With the industry-specific transport networks of Quehenberger Logistics for Retail, Fashion, Tyres and Consumer Goods, you can easily adapt your logistics solution to your requirements. Convenient B2C extra services with added value for individual home deliveries. Delivery straight to your customer or to another designated location, assembly and installation, disposal of packaging materials and returns within the warranty period – no matter your requirements, we have the right solution for you. Borderless service in all matters regarding customs clearance. Competent and reliable support in shipping your goods to non-EU countries for swift and reliable processing of your international transports. Intelligent, efficient industry solutions for Retail: With customised Retail concepts, we facilitate the timely supply of points of sale all over Europe. Customised concepts for the Fashion industry: From transport solutions to professional warehousing and comprehensive value-added services, we offer well-conceived solutions for the Fashion industry. Well-conceived distribution and storage of Tyres: With Quehenberger Logistics, you benefit from procurement, production, warehouse and distribution logistics at the highest level of quality. State-of-the-art industry solutions for the Automotive industry: Customised solutions from just-in-time delivery to production supply and stock management make us a professional partner in the area of Automotive. Comprehensive logistics solutions for the Consumer Goods industry: Daily availability of goods in retail in optimum response to market needs – that’s what our individual solution packages for Consumer Goods provide. You’re looking for a new professional challenge? Then we should meet, because we’re looking for the best. The career opportunities at Quehenberger Logistics are varied and exciting – with us, you’ll move things in a big way! Find out more about our company and current job openings in our Career Portal. As a responsible and forward-thinking company, it’s important to us to contribute to sustainable logistics. Together with our suppliers, we work to optimise the performance and practicability of electrically powered commercial vehicles. Additionally, we pursue a number of future-oriented goals and concepts that put topics such as sustainability and environmental awareness in the foreground. You would like to find out more about our quality standards? Have a look at “Quality & Innovation” at Quehenberger Logistics!